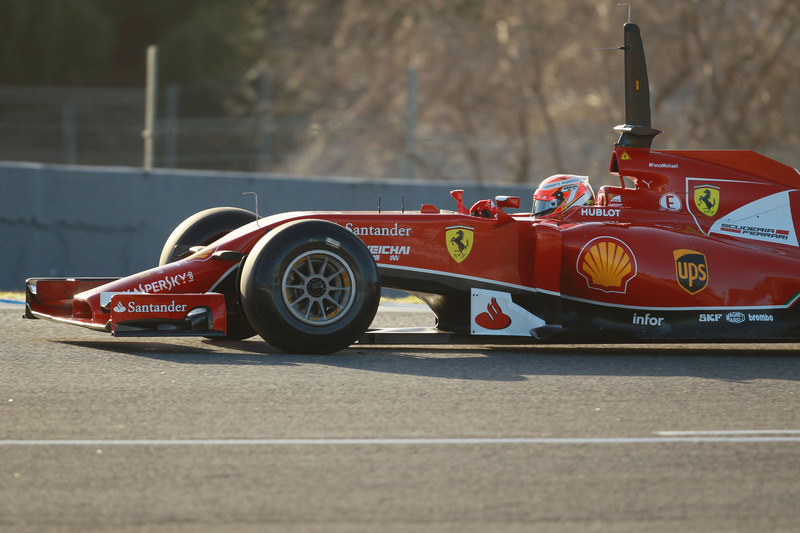 Team testing of their new 1.6-liter turbocharged cars began in Jerez, Spain, today, with Kimi Raikkonen (Ferrari) running 31 laps and posting a session-best lap time of 1:27.104. Lewis Hamilton (Mercedes) was roughly 0.7 sec back, posting an 18-lap best of 1:27.820. Raikkonen’s lap total was the most on the day, with competitors for the most part feeling their way around the all-new rides. Hamilton’s session was cut short despite being the first car on track when a front wing failure put him into the Turn 1 safety barriers. Valtteri Bottas (Williams) ran just 7 laps and posted the third fastest time of the eight cars that took the track, 1:30.082. Sergio Perez (Force India) and Jean-Eric Vergne (Toro Rosso) both had their session cut short by technical problems. Technical troubles also cut short the sessions of defending world champion Sebastian Vettel (Red Bull) and rookie Marcus Ericsson (Caterham), while preventing Jenson Button (McLaren) from taking to the circuit at all. Testing continues at Jerez tomorrow. Click here for full story with drivers’ quotes, etc.